This NNR is one of Wales' top sites for its wide range of habitats and wildlife species. Not only is it in one of the most beautiful parts of Southwest Wales, but the reserve itself is also of exceptional scenic beauty: from shallow, freshwater lakes full of water-lillies in summer; woodland; cliffs; and sand dunes bordering on sandy beaches - this site has it all! The site is also full of achaeological interest with evidence of human occupation dating back at least 3,000 years. 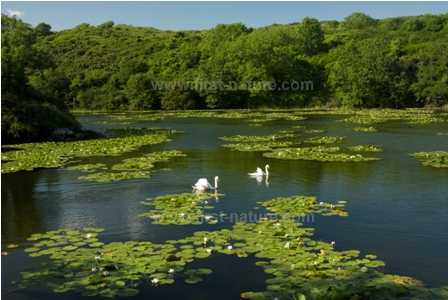 Stackpole NNR, which is managed by Natural Resources Wales (NRW), is about a quarter of the total area of the Stackpole Estate which is owned and managed by the National Trust. There are three points of entry, with car parks, to the Stackpole Estate, Stackpole Quay, Broadhaven Beach and Bosherston village. The entry point closest to the lily ponds is at Bosherston Village (see the map on the left), and this is probably the least difficult and confusing to entrance find. From Pembroke take the B4391 towards Stackpole village and then follow signs to Bosherston village - the National Trust Car Park is signed beside St. Michael and All Angels Church in Bosherston. For Stackpole Quay, follow signs to the National Trust Tearoom from Stackpole village. For Broadhaven Beach, follow signs to Broadhaven from Stackpole village. Precise directions are difficult because, as with so many of the roads in Pembrokeshire, the local roads in and around the Stackpole Estate are unnamed. There are plenty of accessible footpaths to follow from all three car parks, including a 1.5km (1 mile) lakeside path close to the Stackpole Centre (see facilities below) which is suitable for wheelchair users. All three car parks have public toilets. 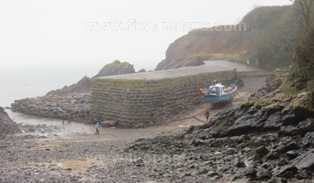 There is a small National Trust Tearoom at Stackpole Quay serving light lunches and snacks. The Stackpole Centre has educational facilites and holiday cottages. It is also home to the 6-acre Mencap Walled Garden, where vegetables, fruit and other produce including plants and shrubs can be bought by the public. The shop is open from Monday to Thursday between 10am and 4.15pm, on Friday from 10am to 3.15pm, and also on publicised weekends throughout the year. 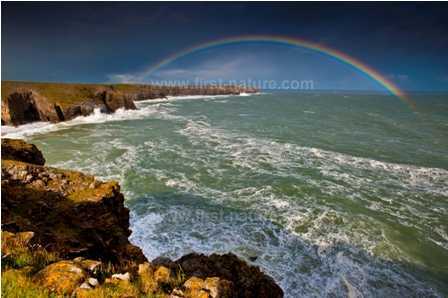 There are plenty of pubs and cafés in the area immediately surrounding the Stackpole Estate. These man-made, shallow lakes were created during the 18th and 19th centuries by damming a limestone river valley. Although close to the coast they are protected from the sea by a small dune ridge, and the lakes are fed by a series of calcium-rich springs. They are best known for their beautiful White Waterlilies (Nymphaea alba), but they are also home to many other interesting aquatic plants including the spiny-looking Bristly Stonewort (Chara hispida) which grows in submerged dense beds (up to 1m high) in the clear lime-rich water of the central and western arms of the lakes. Each of the plants of Bristly Stonewort can be 3.5m in length. This plant is one of the charophytes, which are special because of their long fossil history and the fact that they are the closest living relatitives to the ancestors of land plants. Two other charophytes that occur in the lakes at Stackpole NNR are Chara globularis, Chara virgata and Chara vulgaris. The eastern arm of the lakes has dense stands of Curled Pondweed (Potamogeten crispus), Fennel Pondweed (Potamogeton pectinatus), Spiked Water-milfoil (Myriophyllum spicatum) and Canadian Waterweed (Elodea canadensis). The edges of the lakes are fringed with Common Reed (Phragmites australis), Bullrush (Typha latifolia) and Common Spike-rush (Elocharis palustris). Branched Bur-reed (Sparganium erectum) is also present. The lakes are home to many insects, and more twenty species of dragonflies can be seen buzzing around in summer. In winter wildfowl visit the lakes, but all year round Grey Herons (Ardea cinerea) stand silently as they await unsuspecting prey in the margins. Most of the lakeside is clothed with mixed woodland. These trees and abandoned buildings around the lakes (as well as buildings still in use in the surrounding area which are used as roosts) are home to a number of bat species. Lesser Horseshoe Bats (Rhinolophus hipposideros), and Greater Horseshoe Bats (Rhinolophus Ferrumequinum) are both present. The Greater Horseshoe Bat is the most endangered bat species in the UK, and those at Stackpole constitute nearly 10 percent of Britain's total population. The woods are also important to numerous bird species, many of which breed there during the spring and summer months. A walk along the coastal paths on the Stackpole Estate will take you through sand dunes and maritime grassland, over limestone cliffs, and on to the lovely sandy beaches of Broadhaven and Barafundle Bay. Along the way you will encounter many beautiful wildflowers and special coastal plants as well as Scrambled-egg Lichen (Fulgensia fulgens) which is a threatened species in the UK. If you are lucky you will also see the resident Choughs (Pyrrhocorax pyrrhocorax), which are easily recognized by their red beaks and legs. Choughs are now quite rare in the UK. 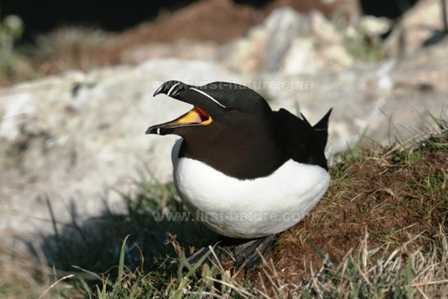 Other birds to look out for include Razorbills (Alca Torda) and Guillemots (Uria aalge).